Earlier today, Good Friday, Irish cameraman Tommy Donnellen was shot in the arm by the Israeli military while filming a protest in the Palestinian village of Nabi Saleh in the occupied West Bank. Mr. Donnellan, who is from the Roscommon border, near Ballinasloe travelled to the West Bank last month. 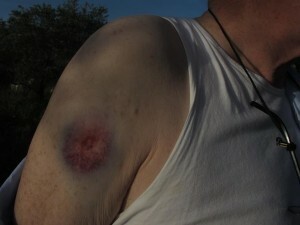 Today he sustained a wound from a rubber-coated steel bullet which punctured his upper right arm. Nabi Saleh is a Palestinian village with a population of 550 people, 20km north west of Ramallah in the Israeli-occupied West Bank. In 1977 the illegal Israeli settlement of Halamish was established on private lands belonging to the villagers of Nabi Saleh and Deir Nidham. In 2009 the settlers took control of several wells belonging to the village, and since then Palestinians in the area have been subject to attack by Halanish’s extremist nationalist settlers. In December 2009 the villagers began to hold weekly peaceful protests against theft annexation of their land. These protests have been frequently attacked by the Israeli military, resulting in countless injuries and the death of one man – Mustafa Tamimi – who was shot in the head by a tear gas canister. Israeli settlements in the West Bank are illegal under international law (Article 49 of the Fourth Geneva Convention and UN Resolutions 446, 452 and 465). Currently there are over 130 of these illegal settlements within the West Bank and East Jerusalem, with a growing population of over 450,000. Israeli settlers are subject to Israeli civilian law, while Palestinians living in the West Bank live under Israeli military law. These settlements effectively carve the region into a series of largely disconnected ‘bantustans’. A series of ‘settler-only’ roads and busses link the settlements to each other and to Israel. Palestinians are forbidden from using these roads and services. Palestinians began a campaign of peaceful protest against the construction of the settlements and the separation wall in 2003. These protests have grown in number and support with people from all over the world travelling to take part in or report on them on a weekly basis. Posted March 29, 2013 in Apartheid, Apartheid Wall, Demonstration, Press releases, Protest, Settlements, West Bank.